Today, I am pleased to announce that my Patreon support page is live. So, if you’d like to donate to support Paper Thin Personas, this is one way you can do so. Feel free to support at any level you’d like, because all is appreciated. However, for those of you who support at 5 dollars a month, you get to join the Vivian Project. What, you might ask, is the Vivian project? Well… let me explain. I moved recently and part of the moving process was going through my massive collection of every single paper doll I ever drew as a child. Some I kept. Some I tossed and then, at the bottom of a box, I found Vivian. Viviean lives in a cookie tin and she was a huge part of my youth and now I am going to re-draw her. Viviean began in June of 1998, but I have no idea when I stopped drawing clothing for her. I think sometime around freshmen year of high-school, maybe a little longer. Viviean was traced from an advertisement (I think in Seventeen or something) for a prom dress designing contest. I did not enter the contest, but I used their little fashion figure to create a paper doll for whom I drew over 200 outfits. How do I know that? Because I literally indexed her whole collection on pieces of paper. Each outfit is numbered on the back and there is a corresponding description of the outfit on one of the pages of clothing index. Each set of outfits, usually five, were placed in a small envelope and sub-labeled such as “Futuristic Fashions” or “History Lesson 1910-1940”. Seriously, I should have known I was destined to be a librarian once I started indexing my own paper dolls. Viviean is has an outfit for just about every occasion a person might ever find themselves in. (And a few, I doubt anyone would likely find themselves in.) For formal occasions, she might slip on Outfit #2: “Long dark blue ball dress with whiet (white) gloves”. I tried to get the gloves to stay on, but they didn’t fit very well. Or if she feels like rocking out, she has Outfit #144, part of the Rock Star Clothing set, including “a very short leather jacket, yellow dress and black boots.” I didn’t see a short leather jacket in the envelope though, so perhaps it has gone missing? Or maybe it got misfiled? After being a rock star, Vivian might need to relax by slipping into into Outfit #174, “a yellow-green terri (terry) cloth bath rope (bathrobe).” I clearly struggled with spelling at that age. Actually, I still can’t spell worth a darn, but that’s why there is spellcheck. And if after relaxing, she wants to fight bandits, than Outfit #156 “Xena- brown leather top with gold decoration” is available. I love the tiny chakra. 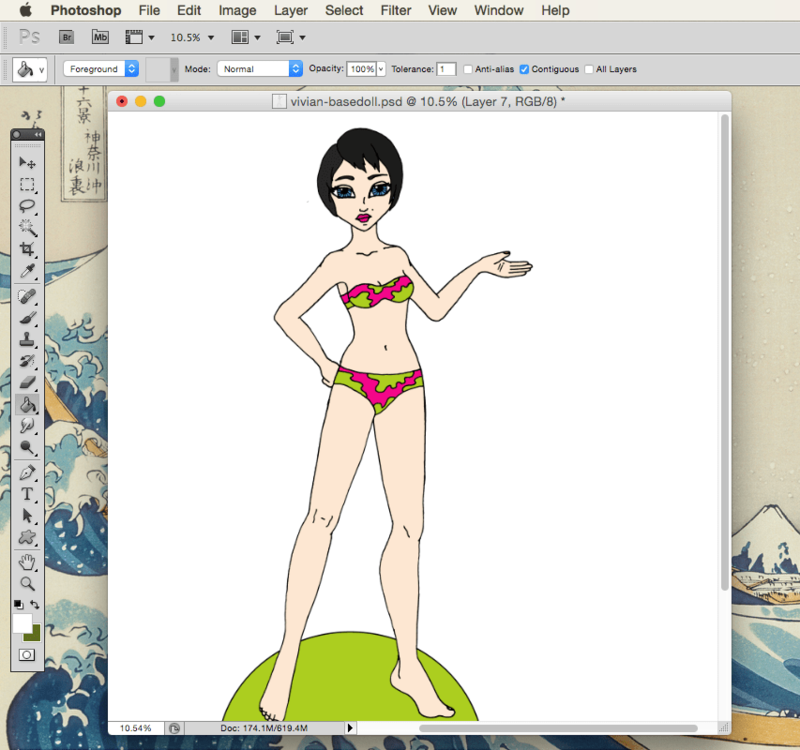 The New Vivian paper doll in progress. The process of re-drawing Viviean into the new Vivian has been fun. She has the same hair, a very similar pose and the same bright pink and lime green swimsuit of her former-self. She’s different as well, because I’ve changed as an artist a lot since Viviean was created. Vivian isn’t a copy, exactly. I think of her more as an “ode” to who I was when I drew her all those years ago. So, why do all this? Well, because I have wanted too for a long time, but also because I was looking for a project that I could do with my Patreon subscribers. So, if you would like to get involved, you can. If you choose to join the Vivian Project than every month you’ll receive a redrawn outfit (or two) from the original Vivean clothing collection and, of course, a Vivian doll of your very own. One month you might receive Outfit #6, a fuchsia above the knee length dress, and then next month you might get Outfit #164, a dress meant to represent the fall with leaves on top, a wreath and cloak, colored orange/red. Patrons will get to vote on the dresses that will be included sometimes and sometimes I’ll just pick something I think is fun to work on. Either way, there will be two versions of each outfit. One is a redraw of the original and other my sense of how I would draw the same concept today. For twenty-five dollars a month, you’ll get to customize a “Friend of Vivian” paper doll by picking out her face, hair style, skin tone, hair color, and eye color. So, if you want a freckled blue haired paper doll, than this is your chance. There are over a hundred options for that customized paper doll. There’s other support levels too from one dollar up and beyond. No pressure, of course, as I’ve said before. If you have to choose between something like rent or paper dolls- choose rent! The blog isn’t going anywhere. Support me here if you’d like. Thank you. Questions? Ask in a comment or send me an email. I am super excited to be making this announcement. Julie, of Paper Doll School, and I are hosting a paper doll round robin. We have our model drawn thanks to Julie, but she desperately needs gowns to wear to the Halloween Masquerade Ball! Step 2: Print the file at Full Size or Open the file with your favorite graphics editor. Step 3: Draw a fantastic masquerade gown. It can be in color or black and white. No judgement here. Just create something that inspires you. Step 4: Email your gown to me at paperthinpersonas@gmail.com or Julie at jamatthews@ymail.com before Midnight (Eastern Time) on the 24th of October. Be sure to include how you’d like to be credited and if you want to say something about your design, than tell us that too! Step 5: Wait until the 31st of October when Julie and I will post the finished gowns and the doll, all ready to attend the Masquerade Ball! See? That isn’t so hard. If you have any questions, please just ask in a comment. This is going to be so much fun. So, remember how on Friday I said there were going to be changes… Well, this is one of them. The time has come to say a sad farewell to the Showcase. I have been horrible about updating it and when I went through my email to clean it up a few months ago, I found dozens of things that people had sent me and I had done nothing with. I felt rather guilty and then decdeed it was time for the Showcase to go. There is now a Pinterest board called “PTP Paper Doll Sightings.” I’ve seen a few pattern designers use this method for showing off the work of people who had made their patterns and I thought it was a great idea. Follow Rachel’s board PTP Paper Doll Sightings on Pinterest. It is so much easier for me to just download the image from my email and post it up onto Pinterest. No fuss, no muss and I get to share things that people don’t send me, but I find around the internet where my art has been featured in various ways. Plus I can link to others sites very easily which lets them get some credit too. So, go check it out and let me know if there is anything I should add to it. So, Miss Missy who runs a wonderful paper doll blog of her own over at Miss Missy Paper Dolls is currently hosting a contest where you design an outfit set on something like Polyvore or Pinterest and then she will let people vote on the winner and draw the fashions for this cute little paper doll. While I am not the most Polyvore savy person, I did two designs. I submitted my favorite, but thought I would share my other one as a way to encourage people to participate. And no… I am not being asked to do this. I just think it’s such a cool idea that I wanted to mention it. The deadline is July 30 though, so create fast! You can read all about it on Miss Missy’s Fresh Fruit Fashion Contest post. Edit 7/30/2015: Missy has extended the deadline to August 7th and updated the rules and prizes. You can read all about it here. For my first paper doll artist to feature in 2015, I knew I wanted to feature a newer artist on the scene, so I interviewed Lina. Lina, of Lina’s Paper Dolls, has been posting her paper dolls for just about a year and ahalf, but her work is wonderful. She focuses on historical paper dolls based on various periods throughout history. Her paper dolls all share the same basic body and are in black and white for coloring. In Lina’s black and white paper dolls, there is clearly a love of history. Her each of her paper dolls has one to five outfits relating to the story of the paper doll and their stories span the globe and time. There’s Carolyn Collins who is in DC during Watergate and Elizabeth Tanner, who lives in Maryland, or Susanne Merritt, who lives in Canada, both during the War of 1812. Simone Spencer is a telephone operator during World War 1. Kalani Hikaru witnesses Hawaiian statehood in 1959. Basia Sienkiewicz survives the Swedish invasion of Poland in 1655. I could go on and on with more of the fascinating historical events Lina ties to her paper dolls. For more information about her paper dolls and our interview go to my Featured Artist Page and you can read about Other Featured Paper Doll Artists as well. Back in June, I formally posted my goals for 2014. In hindsight, I think I was overly ambitious. Honestly, I don’t know what I was thinking when it come to some of them. Still, I’m not displeased with how 2014 went which is good because it ends tonight at midnight. Meanwhile, I got one tutorial up on cleaning up linework and four featured artists (not six, but I’m at peace with that). The thing I am most proud of is that I have regularly checked out other people’s paper doll sites and regularly commented on them. This was perhaps the most important of my goals for 2015. So, what blogs do I regularly look at? In no real order… Liana’s Paper Doll Blog, Pabernukublogi, A Paper Closet, Lina’s Historical Paper Dolls, The Paper Doll Bag and Miss Missy Paper Dolls. I read these because they are updated with some regularity. Did I miss a really good one? Do let me know. Meanwhile, it’s the year end, so it’s time for my annual contest. So, it is time to ask what people would like to see on the blog in the coming year. Post a comment with what you’d like to see up here (repeats of other requests are completely acceptable) and you’ll be entered in my drawing to win a custom paper doll. 3. The winner will receive a one page custom paper doll based on one of my paper doll series within a month of the end of the contest. This one page paper doll can not violate trademarks or copyrights (aka: I can’t draw something under some one else’s trademark or copyright). 4. If there is a delay for some reason, I will contact with winner and we will make other plans. So, feel free to enter by posting a comment on this post about what you’d like to see on the blog in the new year. The contest will end on the 14th of January (midnight, Central time). I will announce the winner by drawing on the 15th, likely in the late afternoon since I will have to actually do the random number generator thing… you know the drill by now.